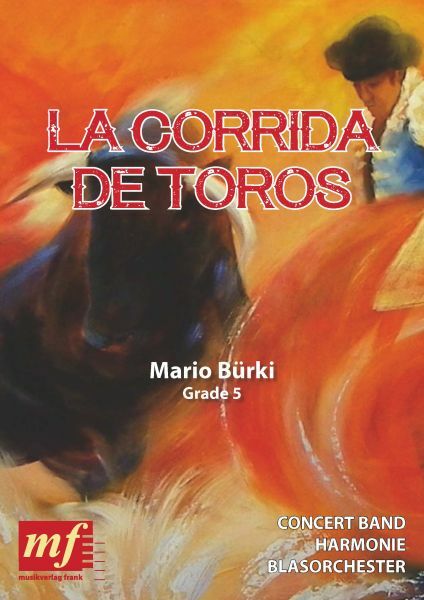 La Corrida de Torros, in english Bullfight, describes a typical spanish bullfight. A Corrida starts with the paseillo, with everybody involved in the bullfight entering the ring and presenting himself to the public. Two Alguacilillos, on horse?s back, direct themselves to the presidency and symbolically ask for the keys to the «puerta de los toriles». Behind that door there are the bulls. With the door being opened and the first bull entering the ring the spectacle starts. It consists of three parts, called tercios, being separated by horn-signals. There are three toreros in each Corrida, by the way, and each will have to torear two bulls. In the first tercio the bullfighter uses the capote, a quite large rag of purple and yellow color. Now enter two picadores, on horse?s back and armed with a sort of lance. The second part is la suerte de banderillas. Three banderilleros have to stick a pair of banderillas into the attacking bull?s back. In the final «suerte suprema» the bullfighter uses the muleta, a small red rag. He has to show his faena, his masterity to dominate the bull, and to establish an artistical symbiosis between man and beast. The Corrida ends with the torero killing the bull by his sword.